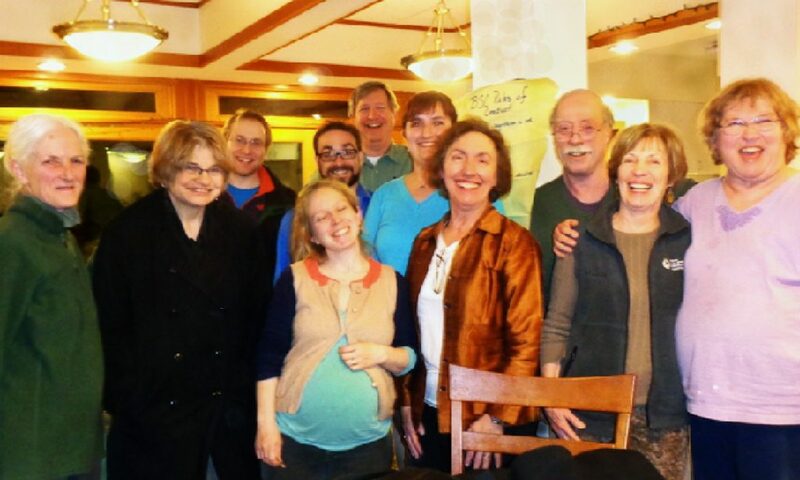 A group photo taken at Cornerstone Cohousing after the visioning workshop in 2013. We intend to create a cohousing community that fosters group cohesiveness and serendipitous social interaction between neighbors. We envision a community in the Boston’s Metro North area with a small-town character and an emphasis on beauty in both architecture and landscape. We seek a diverse, multi-generational community with residents who are eager to participate in both design and governance. We will design our community to facilitate unplanned socializing. We prioritize the needs of the individual in private spaces, and the needs of thecommunity in public spaces. We respect the privacy of the home. Our community will make space for both privately owned homes and shared common facilities. We think of our community as a family of choice. We plan to have community meals on a regular basis. Our members enrich each other through exchange of knowledge, shared projects, and hobbies. Our community shares in music and celebration. Our community is defined by our care and respect for one another and for our common spaces. We follow an efficient consensus-based decision making model. We promote good communication and conflict resolution. We encourage our members to participate in the design process. We plan to welcome participation of renters in community governance. Our community will be inclusive to people of different social, economic, generational, and racial backgrounds, as well as all sexual orientations and gender identities. We will provide a range of unit sizes and prices. We will strive for cost efficiency for individual units. We will provide accessibility to differently abled people. We support an ecologically sustainable lifestyle. We strive for energy efficiency in our community buildings. We strive to reduce fuel use through car sharing and a bike-friendly atmosphere. We strive for a warm and welcoming atmosphere for both residents and guests. Our community will be a safe and nurturing environment in which to raise children. Our ideal community size is 20-30 units. Some or all units will have immediate access to outdoors (private entrances). Our community will have access to quality public schools. The commuting time to Park Street station will be under 1 hour. Our community will be within one mile of regular public transit. Our community will have easy access, by foot or bicycle, to basic services and downtown areas. Our community will be within biking distance to conservation land (if possible).